Patent ductus arteriosus (PDA) is a defect that is caused by failure in closure, after birth, of a temporary blood vessel connecting the left pulmonary artery to the aorta in the foetal heart. 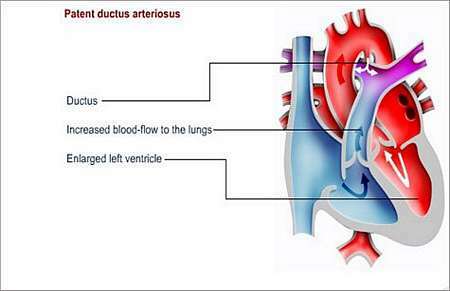 In a normal heart, the ductus arteriosus (a blood vessel between the aorta and pulmonary artery) is open before birth and closes in the first days after birth. In the foetal heart, blood bypasses the lungs and gets oxygen from the placenta. After birth, the newborn babys lungs take over the function from the placenta, the body discontinues producing the chemicals required to keep the ductus arteriosus open and the ductus arteriosus closes naturally. 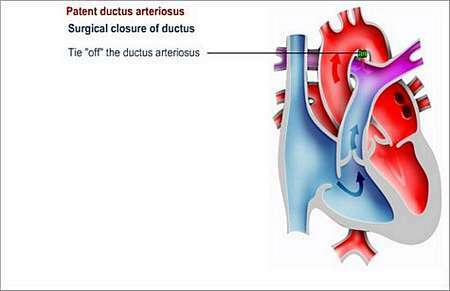 If the ductus arteriosus fails to close completely, the baby has patent ductus arteriosus (PDA). The condition is sometimes, although rarely, associated with mothers who suffered Rubella (German measles) during pregnancy. 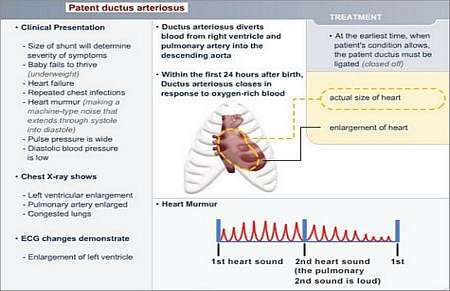 Patent ductus arteriosus (PDA) may also be present in premature (born after a pregnancy of less than 37 weeks) infants. This causes a higher than normal blood-flow to the lungs and a higher than normal return of blood volume to the left ventricle. Depending on the size and duration of the ductus, the patient first develops pulmonary overflow and signs of left heart failure. This results in high pulmonary blood pressure. Most of the children with this condition do not experience symptoms. However, in cases where the ductus is large, the child becomes out of breath and it is often difficult for the child to complete feeds. These children also fail to thrive; compared to their peers, older children with this condition become breathless easily and they tire very quickly when doing physical exercise. With mild cases of PDA, a heart murmur may be the only symptom. In severe cases, too much blood is transported to the lungs, causing increased pressure in the pulmonary (lung) arteries, resulting in fluid build-up in the lungs. When this happens, the patient becomes very tired and short of breath. It may be difficult to diagnose PDA in premature babies, because they often require ventilator (breathing machine) assistance while their lungs develop. The ventilator may mask the patent ductus arteriosus. An Echocardiogram (ultrasound scan) is used to confirm the diagnosis. A chest X-ray and an ECG may also be helpful to assess the impact of the ductal flow. A patent ductus arteriosus needs to be closed; this is done by means of cardiac catheterisation or surgery. In premature infants, PDA can (in some cases) be treated with medicines that cause the ductus to close. In full-term infants and older children, surgery is used to tie off the ductus. In selected cases, coiling devices can be delivered via a catheter-based technique; this procedure is done in a cath-lab. It is important that PDA be corrected as it can lead to congestive heart failure and disease of the right side of the heart (called cor pulmonale) later in life. Cor pulmonale develops as a result of increased pulmonary blood pressure (pulmonary hypertension) and pulmonary vascular changes, which may become irreversible. PDA also increases the risk of endocarditis, a life-threatening infection of the lining that covers the inside of the heart chambers, valves and main arteries. No chest incision (cut) is required and the patient will stay in hospital for one or two nights. 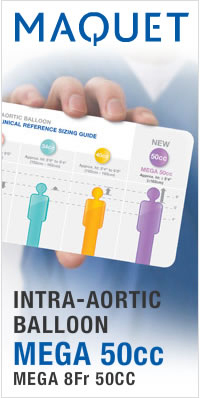 A catheter (a small, fine tube) attached to an umbrella-like device or wire coils is inserted into the vein in the groin and passed into the heart. When it is in position at the ductus, the umbrella is opened and released, or the coils are put in position, closing the duct. In cases where the ductus is large, a second umbrella and more coils may have to be inserted at a later stage. A small incision (cut) is made in the left side of the chest and the ductus is either clipped or tied in order to block the flow of blood. A heart-lung machine is not required for this type of operation. The child usually recovers quickly post-operative. The patient will need to visit the outpatient department regularly for check-ups during the next 24 months. It is important to prevent endocarditis in children with persistent ductus arteriosus. Endocarditis is an infection of the lining of the heart or heart valves.